From Cairns it was a 2 1/2 hour flight to Ayers Rock. The temperature was in the mid-60s after having rained the night before. We heard there was flooding in the Sydney area. 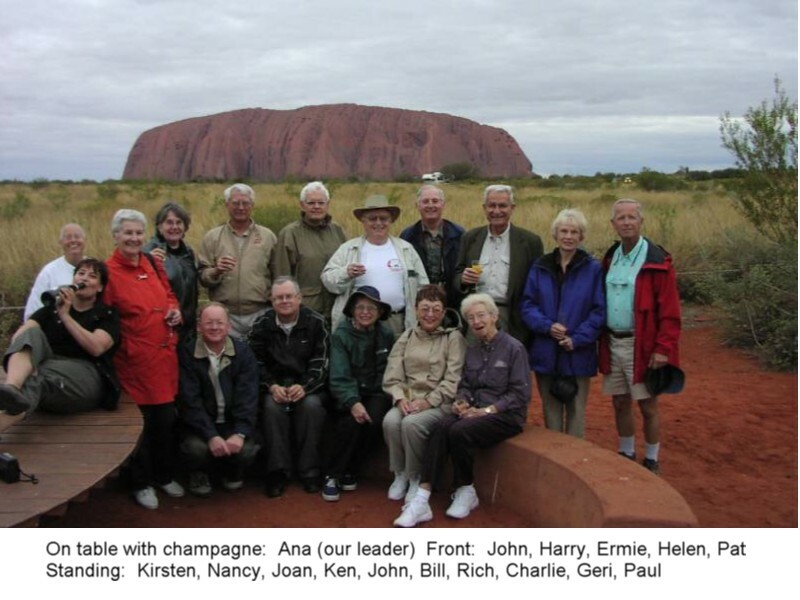 From the airport we departed for our 5-star Sails in the Desert Hotel which is part of the Ayers Rock Resort. We were originally scheduled to stay at the 4-star Outback Pioneer Hotel which is also part of the resort. We had just enough time to drop off our bags and then immediately head out to Uluru-Kata Tjuta National Park. Our first stop was the cultural centre where John had some of the best fish and chips on the entire trip. The centre had a great display of Maruku and Walkatjara arts and crafts (no pictures allowed). The centre is managed by the Anangu, which means "we people," referring to the Pitjantjatjara and Yankunytjatjara people. They have lived in the region for almost 30,000 years.. The next stop was the Kata Tjuta or Olgas Mountain. It consists of 36 large domes, 1791 feet high and 22.4 miles in circumference. We had the opportunity to hike into Olga Gorge. It was interesting to see the eroded mountain up-close. The park road loops around Ayers Rock so it was always in view. We made a few stops to enjoy cave paintings and see a small nearby spring and hear about Aboriginal ceremonies. Then the big moment came as we pulled into the parking lot to witness the sunset at Uluru. The changing colors went from gray to red, all happening in a few minutes. The parking lot then erupted into a champagne tailgate party. It was a fabulous evening. Next to our bus we talked to a group of young backpackers that still had a few months left on their trip. This is the only picture of our entire Australian tour group. We returned to the resort after dark, so never really had a chance to enjoy the amenities. We finally checked into our room and found a double sink in the bathroom, robes, large towels, 8 pillows on the beds. All very nice. It was an exhausting, wonderful day. We were up early for breakfast since we left the resort at 6:15 - John wanted to climb Ayers Rock and Kirsten wanted to walk around the rock. People are not allowed to climb at night, so had to wait for the gate to open at 6:45. Some of the younger people wanted to get to the top of Ayers Rock for sunrise (about 7:15). John took his time (resting frequently), since it was 1,141 feet straight up. A large chain attached to steel poles made it a little easier for the steeper part. Once near the top it was up and down over numerous domes. Once at the top, John found out that the gung-ho hikers missed the sunrise. It was fun talking to other people from the United Kingdom, Ireland, US, etc. Coming down John had sore toes from his feet pressing into the front of his hiking boots. Again it was straight down. John was the only one from our tour group that climbed. One tour couple took the sunrise helicopter ride - reported as spectacular. While John was climbing the rock, Kirsten was walking around it. She completed the 5.8 miles (9.4 kilometers) circumference walk in about 90 minutes. John got back to the bus after his 2 hour climb just in time for departure to Alice Springs. By 9:00 a.m. we were on Lassseter Highway heading east to Stuart Highway. 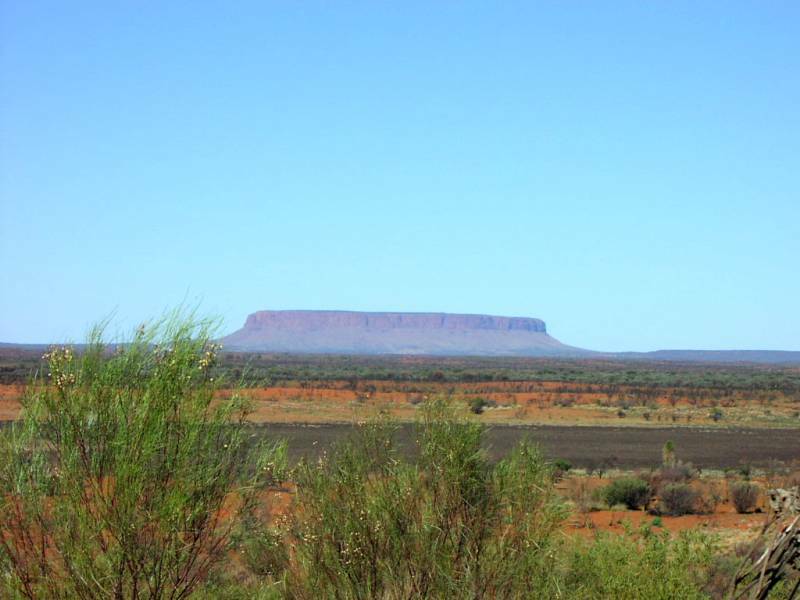 About 80 kilometers east of Uluru is Mount Conner, another large rock rising from the desert floor. Mount Conner or Atilas is 1,128 feet high and 19.9 miles in circumference, and 850 million years old. It's bigger than Ayers Rock! There is only a dirt road into the area. About 160 miles east of Uluru was our lunch stop at the Erldunda Cattle Station. It's a 800,000 acre (2100 sq. miles) cattle ranch run by a young couple (Paula and John) and their two children (9 and 11 years old). They have about 7,000 head of cattle, about 20 water wells and a few dams to maintain which supply 41 watering holes. Every 3 days her husband must replenish the diesel fuel for the generators at the wells. They have only generators to supply electricity even at their ranch house. Only during the mustering season (twice a year) do they hire 2 wranglers for 6-7 weeks. During mustering season cattle over 500 kg in weight are trucked via road train (about 130 cattle at a time) to Darwin. It's a 26 hour trip (1685 km) to the harbour at Darwin. The cattle are sold mostly to Asian markets and Libya. Paula told us of the elaborate "School of the Air" program for the children. Twice weekly lesson plans are mailed from the school district. A two-way radio is used for talking with teachers and daily assignments must be completed. The week before our arrival the family received a new computer and satellite dish to replace the radio. A technician connected everything at the house, but the system was not fully operational yet. When the children reach age 12 (or 7th grade) they must attend a local or boarding school for the next 5 years. Paula plans to send her oldest (Shannon) to Adelaide to board at a cost of A$ 30,000 per year. We had a great lunch with Paula and her children. It was another 110 km north on the Stuart Highway to a rest stop at Stuarts Well. There is a camel farm, a comment on the early history of Central Australia, and the Afghan camel drivers who helped to open up the wilderness. The farm offers interesting camel rides and longer safaris for those who are prepared to brave the back of a camel. It's as close as most tourists will come to experiencing what early exploration of the area was really like. Since we both road camels in the Sahara Desert of Egypt, we let others savor the experience.